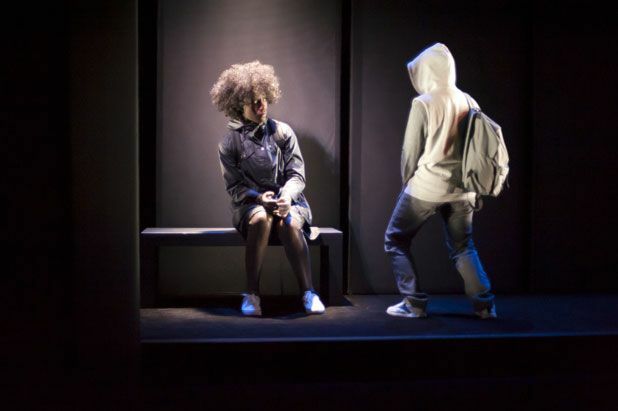 With its gang of hooded teenagers taunting a young black kid, Gustave Akakpo’s play seems at first to be a fairly conventional exploration of racial prejudice. But it soon moves into far more poetic, enigmatic territory as a (literally) skin-shedding girl shifts between being black and white, and the hoodie-wearing gang discover an unexpected kinship through her strange powers. A hit at France’s Avignon Festival in 2014, Compagnie du Veilleur’s quietly masterful show has been transformed into a thoroughly (and convincingly) Scottish affair, with an Edinburgh setting, a brisk, nicely colloquial translation by Katherine Mendelson, and an all-Scottish cast – although in a play questioning the relevance of cultural backgrounds, even that seems a point for discussion. Played between shimmering video projections and real-life actors, it takes an oblique, metaphorical slant on questions of racial identity through some touchingly realistic performances: Moyo Akandé is superb as the mystified girl who soon adores her new powers, and Thierry Mabonga is both vulnerable and assertive as the bullied Mamadou. It’s brief and to the point, with seemingly not a word or gesture wasted, but the points it raises – both lyrical and sophisticated – live long in the memory. Institut français d’Écosse, 225 5366, until 31 Aug (not 17, 24), 2pm, £12 (£10).